Here are some of the resources that you can use to learn about Power Pivot and other Power BI tools. New resources will be added as they are made available. In the window below, you can watch a Getting Started in Power BI playlist that I compiled on YouTube. These tutorials cover the basics of getting started with Power BI. In the window below, you can watch a Getting Started in Power Pivot playlist that I compiled on YouTube. These tutorials cover the basics of getting started with Power Pivot. These courses use video lessons to demonstrate the Power BI techniques, tools and formulas. This free webinar is offered by Mynda Treacy, at My Online Training Hub, a few times each year. 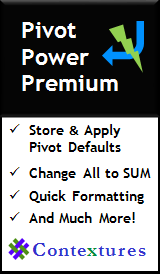 The Power Pivot for Excel Course includes 5.5 hours of video tutorials covering everything from installing Power Pivot, importing data, DAX formulas, PivotTables and more. Download the sample files, and follow along with the lessons. In this hands-on project-based course, you will build a Power Pivot model from start to finish. The training is delivered online and tutorials are available to watch 24/7 at your own pace. Pause, rewind, replay as many times as you like. Watch this sneak preview, to see a sample of the course material, then click here for more information. This course covers the basics briefly, then moves on to intermediate and advanced Power Pivot formulas and techniques. There are 19 hours of video instruction, sample workbooks, Rob Collies DAX Formulas book, and a handy reference card. If you are an absolute beginner with Power Pivot, go slowly through the first few lessons, to ensure that you understand the basics, before going forward. The course is packed with valuable content, and it can be overwhelming if you go too fast. There are no student forums, but you can click a link to send a question to the instructor. Download the sample files to follow along with the lessons. Excel's new Power Query add-in can do amazing things with your data. If you'd like to learn more about it, experts Ken Puls and Miguel Escobar offer live, online Power Query training. You'll have two days of live online training (4 hours per day), then a live follow-up Q&A session, about a week later. 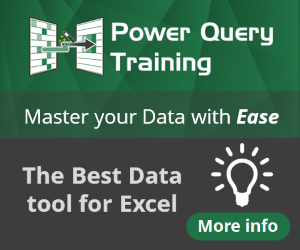 Ken and Miguel also have an online Power Query Academy, where you can go at your own pace. The course starts with the Power Query basics, and gradually builds up to advanced techniques. There are 15 modules, broken into 55 videos (over 12 hours of content). See all the course details and sign up now. These books will take you from the beginner stage, into the advanced levels of Power Pivot and Power Query. Most links will take you to the Amazon website, where you can read the review, and use the "Look Inside" feature, to examine the book, before buying it. These links take you to the latest Power BI news, on Google and other sites. For some pages, such as LinkedIn, you may need to sign in. NOTE: Like other online search tools, use these at your own discretion. Download a copy of the Contextures Power BI Resource List. The list is in PDF format, and you can open it with Adobe Reader.